Americans are likely to think of “boat people” as coming from Cuba or Vietnam, desperately clinging to life and hope in a rusting, listing, failure of a boat. 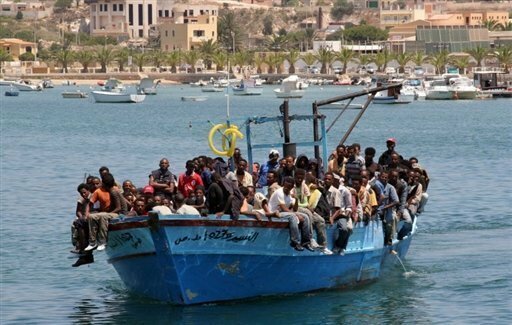 In Italy, the boat people come from Libya and Tunisia. Their landing place is Lampedusa, a dry rock in the Mediterranean, closer to Africa than to Sicily. Tens of thousands have fled Africa for Lampedusa in the past decade, overwhelming the island whose Italian population is about 5,000. More than 50,000 migrants have arrived this year, escaping upheaval in North Africa, looking for some safe haven, a link on the way to a new life. Last January the BBC reported on the feel-good story of a Calabrian village whose mayor turned immigration to advantage, keeping the town of Riace alive. Mayor Domenico Lucano was nominated for the World Mayor award for his efforts to reverse population loss by welcoming immigrants. But Lampedusa has not been so welcoming. residents, Italian premier Berlusconi promising a clean sweep of the illegal immigrants, and in recent weeks violence has broken out when Italy announced a decision to repatriate the boat people. Now, an Italian film on the subject, called Terraferma, has been selected to represent Italy in the Academy Awards. Perhaps this is where most North Americans will learn of the struggles on Lampedusa. I hope a better solution is found than the one pictured here. 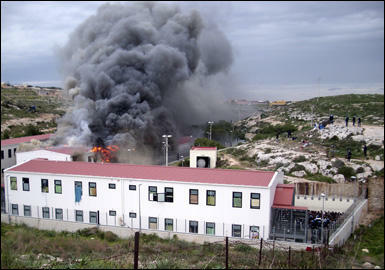 This entry was posted in News and tagged Italy, Lampedusa, North Africa, refugees, sicily, Terraferma. Bookmark the permalink. ← BOOKS: Must have this book!